"The nation that will insist upon drawing a broad line of demarcation between the fighting man and the thinking man is liable to find its fighting done by fools and its thinking by cowards." The distinctive whup-whup sound of the UH-1 Iroquois, or "Huey" as it is better known, can be heard for miles. However, its larger brother, the UH-60 Black Hawk, is much quieter. This is partly due to the design of the Black Hawk's rotor blades; all four blades have tips which are swept back twenty degrees, decreasing the size of the rotor tip vortices and reducing the noise of the aircraft. (Purists can expound upon this for hours, I know). Engineers at Eurocopter have gone a step further, designing rotor blades which are almost silent, thanks to technologies such as Blue Edge and Blue Pulse--innovations in blade design which minimize the interaction between the rotor blade and the rotor tip vortices. As I was having breakfast with a few fellow officers this morning, we decided that it might be interesting to drive the hour or so into Kingston to watch the Olympic hockey finals. According to Google Maps, I live a mere 20 miles from the Canadian border, straight-line distance. In fact, the closest city, in the true sense of the term, isn't Syracuse, New York, but rather, Kingston, Ontario. "Dammit, we need a country briefing to go into Canada", I spat. Foreign travel--even the 20 miles to Canada--required that we get a lengthy briefing from our intelligence officer regarding the diplomatic situation that existed between the US and Canada, and our actions should the US and Canada suddenly sever all diplomatic ties and seal off the border. "We also need a DA 31 leave form, too, complete with the address and telephone number of the bar we'll be watching the game in", noted one captain. "Address? Can we just write in 'whichever bar has the greatest amount of chicks'?" I added. "Don't forget that we need to fill out a risk assessment for the drive to Canada", said a lieutenant. "Which is strange, because it's a lot quicker and safer to drive to Canada than it is to go to work in the morning. 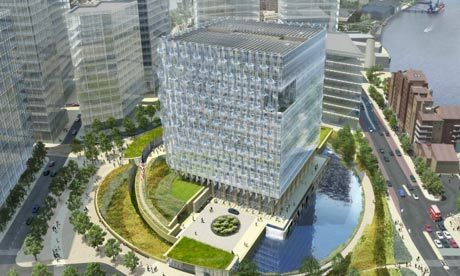 Oh, and you need a cover sheet for all of this..."
This week, the international community mocked the US State Department's plan to build a massive Borg Cube in the middle of downtown London. Not surprisingly, commentators, such as Foreign Policy Online's Stephen Walt and The NY Times' Nicolai Ouroussof have decried the new design. Both claim that the design sends the wrong message to the world, as the embassy looks more like a fortress than anything else. So we have to build embassies that resemble fortresses, and that convey an image of America that is at odds with our interests and our own self-image, and especially with the image that we would like to convey to foreign peoples. We like to think of our country as friendly and welcoming, as open to new ideas, and as a strong, diverse and confident society built on a heritage of pluck and grit. You know, we're supposed to be a society built by generations of immigrants, pioneers, and other determined folk who faced adversity and risk with a smile and a bit of a swagger. Yet the "Fortress America" approach to embassy design presents a public face that is an odd combination of power and paranoia. Who would have thought we'd be sending a mixed message to the world with the design of fortress-like embassies? Certainly not this particularly snarky captain. The other day, Adam Elkus posted a link, leading me to a blog which discusses counterinsurgency-related games called "PaxSims". As you may know, I like to examine the various computer programs the military uses to simulate conventional war (such as the JANUS system), versus commercial programs which simulate insurgency and nation-building campaigns (Jagged Alliance 2, Civilization, etc). While PaxSims doesn't include a mod of Civilization IV which allows you to replay The Surge, it does showcase some great efforts in designing programs to simulate complex situations, such as pandemics, insurgencies, and ecological development. According to the official US Southern Command blog, elements of the 2nd Brigade Combat Team of the 82nd Airborne Division, known as the "Falcon" Brigade, are returning to their home base in Fort Bragg, NC. The 2nd Brigade deployed to Haiti last month in response to the massive earthquake which struck the island nation, causing an estimated 230,000 deaths. Thousands of Soldiers from the 2nd Brigade were on the ground in force within days of the earthquake, delivering water, food, and medical supplies to the victims of this tragedy. The 2nd Brigade has a Facebook page which chronicles their accomplishments during this deployment. Congratulations, Falcons: All the way, Airborne! A link to my post, "Allahu Akbar or Leeroy Jenkins", now appears at the bottom of one of the most prestigious Leeroy Jenkins fan pages. I can die happy now. Over the past month, I've been doing some research on the 2006 Lebanon War for CENSA's upcoming essay compilation. One of the things that struck me was how many COINtras have used the war to "prove" that the IDF either spent too much time conducting counterinsurgency, and how many COINdinistas used the war to "prove" that the IDF spent too much time preparing to fight armored formations. Gotta love that confirmation bias. This morning, I decided to take a break from the Lebanon War and started to read an essay from Jonathan B. A. Bailey, which appeared in the book The Past as Prologue. Interestingly enough, after reading the first paragraph of the essay, I realized I had stumbled upon a thoughtful perspective on the punditry surrounding the Lebanon war. Although Mr. Bailey's essay, "The Pathology of Lessons Learned", speaks of the Russo-Japanese War of 1904, the following excerpt could just as easily apply to the mountain of literature which surrounds the Lebanon War. ...It is hard to identify any lesson of the war that was not appreciated or documented at the time. Inevitably, many of these lessons were contradictory, peculiar to the theatre, and more or less appropriate to different military cultures. Moreover, observers viewed those lessons through the distorting lenses of political intrigue, social attitude, military orthodoxy, and wishful thinking. The result was what historians at the beginning of the twenty-first century see now as having been clear auguries of the future of warfare generally went unheeded. The military organizations of the time often proved lethally wide of the mark. Perhaps the greatest lesson of the war was how human folly can arrive at lessons that in the end prove to be self-destructive and delusional to a gargantuan degree. You may remember that just a few months ago, the milblogosphere was abuzz with debate over whether NATO should pursue a "counter-terror" approach to Afghanistan versus a "counter-insurgency" approach. Both sides had their merits, of course, but neither are really the answer to Afghanistan; if we can even approach such a problem with an all-encompassing, "fix-all" solution to begin with. The COIN crowd failed to really address how a counter-insurgency campaign in Afghanistan served to limit al Qaeda's "freedom of movement"--if such a thing is really an accurate term in a counter-terror campaign. The counter-terror crowd, similarly, failed to answer how they intended to get the valuable human intelligence they needed without large numbers of troops engaged in the areas where our enemies are hiding. Most pundits seemed to lean towards one extreme or the other. However, with the latest offensive in Helmand province, and with the recent arrests of members of the Quetta Shura and the Haqqani network, it looks like we may be incorporating both COIN and CT, with good results, although there's still much to be done. While the capture of Mullah Baradar and other operatives are certainly welcome developments, the Taliban are not al Qaeda. As of yet, we still appear to be no closer to apprehending Osama bin Laden. In fact, a few sources had even indicated that the Quetta Shura Taliban--headed by Mullah Mohammed Omar--has either severed or was considering severing ties with al Qaeda altogether. That's not to say that there isn't a relationship between al Qaeda and other members of the "little 't' taliban". The Haqqani Network, a Taliban-allied group of fighters in Waziristan, led by one of Mullah Omar's former ministers, is reported to maintain close ties with Osama bin Laden, and is considered one of the most lethal organizations in the Af-Pak region. However, with al Qaeda's attacks as of late consisting of little more than bombs hidden in underwear (and other areas), should we really be that worried? This week's capture of key Taliban leaders will likely be only a temporary victory, as the Taliban have previously had little problem in replacing killed or captured leaders. Nevertheless, last week's arrests--which nabbed nearly half of the Quetta Shura--combined with the recent push in Helmand, could be enough to unbalance the Taliban and regain the momentum the US had shortly after the invasion of 2001-2. Confidence among the local population is of the utmost importance in counterinsurgency, and the latest events might tip the Afghans' confidence back into the favor of ISAF and the Afghan Army, at least for the time being. Today, the milblogosphere was treated to a showdown between two Colossi of CNAS, Titans of Tactics, Sultans of Strategy. In one corner, we have Pulitzer Prize-winning Tom Ricks, posting in the New York Times, who claims that US forces will likely remain in Iraq beyond the December 2011 deadline, albeit in vastly reduced numbers. In Ricks' opinion, Iraq is unraveling (on part XXIX right now), and might likely descend back into a civil war similar to what we saw in 2005, particularly after next month's national elections. In the other corner, we have Marc Lynch, a Middle Eastern expert who used to blog at Abu Aardvark and has since moved to Foreign Policy Online. Mr. Lynch feels that the Obama administration is committed to complete withdrawal from Iraq, despite reports that General Odierno is drafting plans to stay in Iraq past 2011. In Mr. Lynch's opinion (and mine), plans of this nature are par for the course for military operations; successful military planners have to at least consider the worst-case scenarios. Interestingly enough, Lynch seems to echo Ricks' pessimism about Iraq, noting that he feels that the end state in Iraq will be certainly less-than-optimal, but not catastrophic, as Ricks believes. All the existential questions that plagued Iraq before the surge remain unanswered. How will oil revenue be shared among the country’s major groups? What is to be the fundamental relationship between Shiites, Sunnis and Kurds? Will Iraq have a strong central government or be a loose confederation? And what will be the role of Iran (for my money, the biggest winner in the Iraq war thus far)? Unfortunately, all of these questions have led to violence in the past, and could again just as the Obama administration’s timeline calls for troops to leave areas that are far from quiet. The plan this year is to pull out about 10,000 troops a month for five months, beginning in late spring. That will halve the American military presence, with the remainder (other than a “residual force” of unspecified size) scheduled to be withdrawn in 2011. The withdrawal plan was written on the assumption that the elections would be held late in 2009 or early in 2010. Under the plan, troop numbers would be kept level to ensure stability in a vulnerable period, especially if the Sunnis were to feel that the electoral process was unfair, or if they were not given a role in the new government commensurate with their success at the polls. But given the changed timetable, just as Iraqi political leaders are struggling to form a new government, American military leaders will be distracted by the myriad tasks of supervising major troop movements. On top of that, the deeper the troop withdrawals go, the more potentially destabilizing they will be — because the first withdrawals will be made in areas that are considered more secure, or where Iraqi forces are deemed more reliable or evenhanded. In addition, a continued American military presence could help Iraq move forward politically. No one there particularly likes having the Americans around, but many groups seem to trust the Americans as honest brokers. And there would be a moral, humanitarian and political benefit: Having American soldiers accompany Iraqi units may improve the behavior of Iraqi forces, discouraging relapses to Saddam Hussein-era abuses, or the use of force for private ends and feuds. Advisers not only instruct Iraqi commanders, they also monitor them. The drawdown will probably matter considerably less than people expect. With the new SOFA-defined rules of engagement, U.S. forces have already stopped doing many of the things associated with the "surge." The Iraqi response to American efforts on the de-Baathification circus demonstrate painfully clearly that the nearly 100,000 troops still in Iraq gave very little leverage on an issue which the U.S. at least publicly deemed vital -- a point made very effectively by Ambassador Hill at the Council on Foreign Relations last week. The sharp backlash against even the measured criticisms by U.S. officials offers an important lesson: Doing the sorts of assertive things which may please Obama's critics are highly likely to spark a negative reaction among Iraqis, generating more hostility to the U.S. role without actually accomplishing anything. The U.S. is wise to avoid them. That doesn't mean that things are rosy. The de-Baathification circus has demonstrated the fragility of Iraqi institutions, and helped to reignite sectarian resentments and fears (many Sunnis feel targeted, while many Shia are being treated to an endless barrage of anti-Ba'athist electoral propaganda). There's very much a risk of long, drawn-out coalition talks after the election. It isn't certain how a transition from power will go, should Maliki's list lose, given the prime minister's efforts to centralize power in his office over the last few years. There may well be a spike in violence by frustrated losers in the elections. If there's massive fraud on election day, things could get ugly. The elections, already marred by the de-Baathification fiasco, may well end up producing a new Parliament and government which doesn't really change much. There are big, long-deferred issues to confront after the elections, such as the Article 140 referendum over Kirkuk. But none of those issues would be resolved by an American effort to delay its military drawdown. They generally fall into the "sub-optimal" rather than the "catastrophic" category. An American decision to delay the drawdown would not likely be welcomed by Iraqis in the current political environment. Nor would it generate more leverage for the U.S. over internal Iraqi affairs. Iraq's future is not really about us, if it ever was -- not a function of American military levels, commitment, or caring, but rather of internal Iraqi power struggles and dynamics. Although both bring up great points, I think the debate is irrelevant without considering the 2012 presidential election season--which kicks off right as the December 2011 deadline passes--as well as the American public's attitude towards Iraq. I would suspect that the voters might demand total withdrawal, but only time will tell. 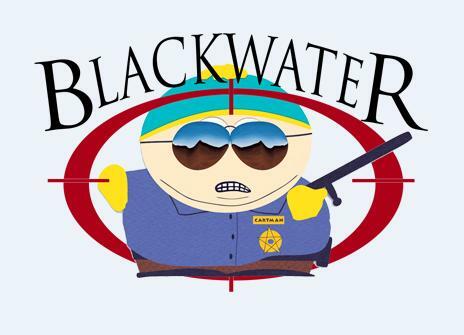 On one of those occasions, in September 2008, Chief Warrant Officer Greg Sailer, who worked at 22 Bunkers and is a friend of a Blackwater officer working in Afghanistan, signed over more than 200 AK-47s to an individual identified as “Eric Cartman” or possibly “Carjman” from Blackwater’s Counter Narcotics Training Unit. A Blackwater lawyer told committee staff that no one by those names has ever been employed by the company. Eric Cartman is the name of an obnoxious character from Comedy Central’s popular “South Park” cartoon. "We have a signed document that says one of your employees used government funds to solicit a prostitute. Is there a 'Rick James' in your organization?" I also dig the sanitized description of Eric Cartman. Referring to Cartman as "obnoxious" is putting it, well, quite succinctly to say the least. While the US Olympic hockey team's 5-3 victory over Canada was impressive, it pales in comparison to America's defeat of the Soviet hockey team in the 1980 Lake Placid Olympics, which occurred 30 years ago today. It's the sporting event which gave America hope during some of the darkest days of the Cold War. Sports Illustrated's cover contained a photograph similar to the one on the to the left with absolutely no caption at all, the only time the magazine has ever done so. According to the editors, the picture spoke for itself. Bonus trivia--the 1980 US/Soviet Union hockey game popularized the famous "U-S-A" chant. We in the milblog community are avid readers, as evidenced by the plethora of posts about reading lists (to include a list of reading lists here at WOI). Indeed, the Army has long recognized the value of reading for professional development, with the Chief of Staff of the Army publishing an annual reading list for soldiers of all ranks. Certainly, looking at the great minds in the US Army--General Petraeus, Brig. Gen. McMaster, Col. McFarland, Col. Mansoor, Lt. Col. Nagl, etc--we can see the positive effects of a lifetime of reading and learning. Recently, a few officers at the US Army's Company Command forum--a secure website where company commanders discuss work-related issues--have created a reading list for new platoon leaders and company commanders, which is receiving quite a bit of attention within the Army and also from our sister services as well. These officers implemented a reading program within their unit, forcing new leaders to get in the books and learn lessons from military leaders from generations past. Nevertheless, as much as I like to read, and as much as I believe in professional reading programs, I've never been forced to read a book--aside from Army manuals and FAA regulations--in nearly eight years in the Army. In fact, when I got to my first unit, my company commander flat-out stated that he would never assign a book report to platoon leaders because he--and I quote--"hated to read". Part of the reason I was never assigned a book to read revolved around the fact that, as a new lieutenant, I was expected to spend most of my time reading my aircraft operator's manual, my unit's standard operating procedures, and other technical and regulatory works. In all honesty, there simply wasn't enough time to read for pleasure. Plus, reading Army manuals will pretty much kill your desire to read, anyway. The operational tempo of the Army, with its year abroad followed by a year at home, is such that precious home time is often so full of training exercises, equipment fielding and the like, that we don't want to take away an officer's little remaining free time with assigned reading. Not to mention, a lot of commanders are not avid readers themselves, and, if they do assign books, they are often books from the PX, many of which have little intellectual value, and are often the military equivalent of dime-store novels or Harlequin romances. Even in professional military education, I've found that the reading requirement was generally waived or pencil-whipped. Strangely enough, though, some odd circumstances came together during my time in the Aviation Captains' Career Course that spurred me to start reading at an even more voracious rate. The first was the fact that I knew that the Army was not going to teach me to fight in the 21st Century counterinsurgency environment. While there is valid debate as to how much counterinsurgency theory we should be teaching, it's safe to say that, if we're fighting insurgencies in two different wars, we ought not spend most of our time discussing Soviet BMP-2s and Division Tactical Groups. That, coupled with a strange new shift in tactics which was then called "The Surge", spurred me to start reading as much as I could about counterinsurgency. The second such influence came through an unlikely source--the one and only Tucker Max. Yes, that Tucker Max--the guy that insults vacuous sluts, beats up sporting mascots, and fornicates with the vertically-challenged. Well, Tucker Max also has a reading list of some really good books, such as Thucydides, Homer and the like. Tucker introduced his readers to an author named Robert Greene, who wrote a series of books about Power, War and Seduction. From Robert Greene, I found references to all sorts of great books on strategy--Lawrence, Boyd, Machiavelli, you name it. I committed myself to reading as much as I could. After all, what else was I going to do in lower Alabama? While it is difficult to establish a reading program in peacetime, it's relatively simple to implement one during deployments. Troops can get quite bored, particularly when bad weather rolls in. Plus, reading is a much more productive alternative to playing XBox360 for hours on end. Focus: Does anyone else have a similar experience with military reading programs? It's going to be a slow day blogging, as I'm working on my CENSA essay and doing some miscellaneous errands this weekend. Nevertheless, I thought this blog entry at Nancy Youssef's Nukes and Spooks was particularly post-worthy. So what is the first thing you say when the highest-ranking military officer from your closest allied nation comes for a visit, particularly when you are situated in the Middle East and your ally provides you $1 billion in aid annually, including $360 million for military training? Thanks for the money and training? Let’s talk about the wars in Iraq and Afghanistan? What are you doing about the Palestinian-Israeli conflict? No, such introductions are simply too heavy between friends, or so it turns out. No, when the leader is King Abdullah II of Jordan and the visitor is Adm. Mike Mullen of the United States, the best introduction to a visit is: “I saw you on the Daily Show, and it was great.” Or so I discovered today while traveling with the chairman here. Sources in the room tell N&S that the king went on to explain that he often watches the Daily Show with Jon Stewart to measure the pulse of American sentiment on world affairs. And that was how today’s meeting began. The chairman apparently thanked the king for his sentiments and explained that he hadn’t seen his segment on the show himself. (Why would, I suppose, since he was there.) But if you would like to see what the king of Jordan was talking about, click here. Robert Haddick, a regular poster at Small Wars Journal and at Foreign Policy Online had many of the same questions that I had about Mullah Baradar's capture. Over the past few years, I've enjoyed reading about the topic of guerrilla warfare, both from the perspective of successful counter-insurgents and from insurgents themselves. Nevertheless, I found it kind of peculiar that, whenever the topic of insurgency is brought up, the US military neglects to mention the obvious example of the American Revolution. The American Revolution has all the elements of a successful insurgency. You have the perceived sense of the illegitimacy of the British government in the colonies ("no taxation without representation", anyone?) The British Army was far too small to successfully occupy and pacify the vast majority of the American countryside, in opposition to what we now know about successful counter-insurgency. As in many insurgencies, the Colonists received military aid from a foreign power (France), hoping to bankrupt their Britain in a proxy war. Not to mention, the Colonists had a well-trained militia--the Minutemen--ready to marshal at a moments notice, much like the Mahdi Army in Sadr City, Iraq. Most importantly, America's leading general, George Washington, lost the majority of the battles he participated in, yet he found himself the victor in the war, foreshadowing a famous statement made by an NVA officer about the Vietnam War. I wonder if we simply don't think of the American Revolution as an insurgency because we have a popular image of the war being fought by rows of men marching rank-and-file towards one another. Does anyone have any good books to recommend about the original American insurgency? Update: In addition to the arrest of Mullah Baradar, we've also witnessed the death of the brother of Sirajuddin Haqqani, the head of the Haqqani Network, in a drone strike in Pakistan. Drones gone wild, indeed. It's really difficult to discern the implications of Mullah Baradar's arrest in Pakistan. Attempting to read too much into the Taliban based on scattered news articles and rumor is a lot like listening to the ancient auguries predict the future based on animal entrails, so I'm hesitant to listen to the pundits on this one. Nevertheless, I've got a few questions which are downright baffling to me. Until recently, the Pakistani government has outright denied the existence of what we term the Quetta Shura--essentially a high council of leaders from the remnants of the ousted Taliban, believed to have been hiding in the Pashtun-dominated city of Quetta, in Baluchistan province of Pakistan. Now we see Mullah Baradar's arrest in the city of Karachi, a port city, and one of the largest cities in Pakistan. Was Mullah Baradar captured in the city? Are Taliban leaders currently hiding in one of the largest cities in Pakistan? Would al Qaeda leaders be moving with Taliban leaders, or do they remain in the border regions? Mullah Baradar had advocated a less brutal approach than Mullah Omar and many other Taliban leaders, and had also seemed to be spearheading an effort to reach some sort of settlement with the Afghan government. Are we witnessing an ideological shift and, maybe, a split away from the Taliban as a result of its tactics? Certainly, it wouldn't be without precedent. Al Qaeda in Iraq saw its ranks thin after their campaign of brutality--largely directed at their fellow Muslims--tarnished their image and led to the Awakening movements. Al Qaeda central is also finding it difficult to recruit. Could it be that the Taliban are also finding it difficult to hang on to their supporters as well? I haven't had the time to follow the war in Afghanistan as closely as I would have liked to recently. Does anyone have any experience of insight to share? Another day, another great article from Small Wars Journal. Today, I was treated to a great piece on "Female Engagement Teams" (or "FET"), teams of female American service members and linguists who gather human intelligence and perform medical care in Afghan villages. Counterinsurgency is all about the population, and guess what: half the population is female. More importantly, women also comprise the most vehemently anti-Taliban portion of Afghanistan's population. If you're looking to start an "oil spot" among the local population, winning over the women is a good starting point. Some officers still imagine that engaging women is not worth the effort. “Pashtun women don’t have enough influence or knowledge to make valuable allies,” they argue. On the contrary, experience confirms that local women wield more influence in their homes—including over their husbands and their sons—than people uninitiated in Afghan family culture believe to be the case. ...Many Pashtun men, far from shunning American women, show a preference for interacting with them over U.S. men. Pashtun men tend to view foreign women troops as a kind of “third gender.” As a result, female servicewomen are accorded the advantages, rather than the disadvantages, of both genders: they are extended the respect shown to men, but are granted the access to home and family normally reserved to women. In many circumstances, this attitude opens opportunities to allied forces. Afghan culture turns out to be more flexible than many male officers have conditioned themselves to believe. As the article stresses, few commanders realize the value of FETs, and the teams are often undermanned, or staffed by female "volunteers"--which, in military terminology, means less-than-enthusiastic participants in the program. Moreover, serving on a FET is an "additional duty" for many, which means that a number of female service members still have to perform their regular "day jobs". In addition to the obvious difficulty of balancing two jobs, the New York Times also hints at a bigger issue, one of petty office politics. Indeed, if commanders are forced to give up a female for the FETs, they might choose to send their less-than-stellar performers, allowing their better female troops to divert their full attention to their regular duties. Once again, petty office politics sometimes rears its head. Certainly, it should not be too difficult to fully staff these teams. There are many females assigned logistical or administrative jobs on large forward operating bases who would love to get out from behind a desk and participate in FETs. In fact, on larger forward operating bases, it's easy to forget that you're in another country, as there's often little more than US service members and contractors running about. Surprisingly, female service members had a higher chance of becoming pregnant than they did of meeting an actual Afghan female "outside the wire"! I found it interesting that many FET members actually asked to have their tours of duty extended, and claimed that they would volunteer to return to Afghanistan as a FET. Rank need not be a factor among FET team members either, FETs need women with good social and diplomatic skills, and they need full-time, enthusiastic participants, not "hey-you" team members. There are a lot of great vignettes in the article that are well-worth reading. Most amusing, though, was the ending, in which the authors dubunk the rumor that women aren't allowed in jobs which specialize in combat. People still believe that in this day and age? According to numerous sources the Chief of Staff of the Army approved a plan today to field MultiCam to all Army forces in Operation Enduring Freedom (Afghanistan) beginning as soon as possible. This is implementation of the decision brief’s Course of Action 1 which called for the fielding of MultiCam to all Army personnel engaged in OEF-A. Other options offered to GEN Casey included fielding a less robust MultiCam package focused on phased implementation with ground maneuver elements as well as a plan to maintain the status quo which is the use of the Universal Camouflage Pattern. It is important to note that the decision to field MultiCam uniforms and equipment currently only affects forces operating in OEF-A. Contracts could begin to be modified as early as this week and OEF-A bound Soldiers should begin to see clothing and equipment as early as July with in-theater fielding starting in August. UPDATE: Apparently, congratulations are a bit premature. According to multiple sources, the information above is still valid but due to the level of visibility on this issue, the Secretary of the Army, the Honorable John McHugh still needs to consider the issue and make a final decision on the CSA’s recommendation. Although GEN Casey has approved the plan, this is not yet a done deal. We will keep you posted. The arrest of the Taliban's chief of operations, Mullah Abdul Ghani Baradar, is certainly a welcome development in the war in Afghanistan. Nevertheless, it's difficult to put the arrest in context. What does Baradar's arrest mean for the ISAF effort in Afghanistan? Some, such as CIA veteran Bruce Reidel, have claimed that Baradar's arrest could "cripple" the Taliban, at least temporarily. While this will certainly cause some disorientation, particularly while NATO is on the offensive in Helmand Province, I'm not quite so optimistic that it will be that devastating. As Joshua Foust notes, the Taliban have suffered the loss of other top-level commanders before, with little setbacks. Similar insurgent groups, such as al-Qaeda in Iraq, have also suffered the loss of one or two top leaders and kept on fighting. Nevertheless, the NYT reports that six members of the 19-man inner Taliban circle have been killed or captured in the last three years. However, others inevitably stepped up to fill their slots. After years of Pakistani agencies--particularly the ISI and Frontier Corps--blatantly supporting the Afghan Taliban, we suddenly see the arrest of a major Taliban official. The Wall Street Journal offers the view that General Stanley McChrystal convinced the Pakistanis that cracking down on the Afghan Taliban--seen as a proxy for Pakistan--meant dealing a blow to the Pakistani Taliban, which has proven to be a thorn in Pakistan's side recently, staging a number of daring raids within 100 miles of Islamabad. Others, however, echo the belief that Pakistan's actions are less than altruistic, and often come with ulterior motives. Baradar had reportedly fallen out of favor with Mullah Mohammed Omar for a few reasons. The first was bureaucratic--Baradar had selected commanders without the the approval of Mullah Omar. (So much for those who think the Taliban operates without micromanagement) The second involves Baradar's alleged "negotiations" with the Afghan government and potentially even the US and Pakistan. According to Josh Foust, Baradar is seen as a less extreme Taliban commander--even writing the Taliban's insurgency field manual as a way to balance some of the Taliban's more heavy-handed approach. Wait, is this the Taliban's Petraeus? This, as Foust continues, means that Baradar's successor might be more heavy-handed. Nevertheless, peeling away some of the softer elements of the Taliban can certainly be a welcome development. In fact, some feel strongly that not only will he talk, but that he will be able to negotiate while in prison. The bit about negotiation while in captivity kind of baffles me--apparently I heard that this was used in the case of the Northern Irish, but I'm not certain how much negotiating one can do in captivity. Can the Kings of War help me on this one? Is someone who has, apparently, been written off by the "mainline" Taliban be in any position to strike a bargain? Bonus: Foreign Policy's Af-Pak Channel has a decent roundup, and does a good job of describing Baradar's importance in the organization. Every now and then, I like to have story time here at WOI. Today's story is about someone who gave someone else a lot of training, only to have the beneficiary of said training later become his greatest enemy. Knowing how this blog operates, you're probably guessing that it's going to be the story of Star Wars or it will be the story of American foreign policy in the 20th Century. Today, Major Jeremy Kotkin penned an article in Small Wars Journal about the recently-deceased Senator Representative Charlie Wilson, a particularly colorful senator who famously suggested that the US provide mujahadeen rebels in Afghanistan with weapons in order to rout the Soviets. While many cite this as a proximate cause of the fall of the Soviet Union, we also can't help but notice that--in hindsight--it created more problems than we had originally intended, a phenomenon known as "blowback". Major Kotkin lambastes Senator Wilson et al for such a reckless decision, although, as many respondents have pointed out, such a criticism is made only with the benefit of 20/20 hindsight. Not only is this critique somewhat unfair, it fails to acknowledge that, unfortunately, the US has often been forced--by necessity--to act under the "enemy of my enemy equals my friend" approach to foreign policy. This approach has led to some admittedly baffling foreign policy decisions when viewed in hindsight. The US was allied with the Soviet Union during the the war against Nazi Germany, only to find a nuclear-armed Soviet Union as its greatest threat in the post-war era. A few decades later, the US attempted to counter and contain Soviet expansion by entering into the Central Treaty Organization with Iran, even going so far as to give Iran the latest F-14 Tomcats in order to curb Soviet overflights with MiG-25s. However, as we all know, Ayatollah Khomeni seized control of Iran and declared the United States "The Great Satan". In response, the US began to support a guy by the name of Saddam Hussein, who was the leader of a country called Iraq, then at war with Iran. Iraq, of course, ran afoul of the US in 1990 after its invasion of Kuwait, causing the US to come to the aid of Saudi Arabia, which was, at the time, the home of a guy by the name of Osama bin Laden. Osama bin Laden, concerned Iraqi troops presumably poised to strike the oil fields of Saudi Arabia, begged the Saudi royal family not to let non-Muslim troops into the Holy lands of Saudi Arabia, proposing that his mujahadeen defend Saudi Arabia instead. The Saudi royal family denied this request, and hosted hundreds of thousands of foreign troops, which served as a catalyst for Osama bin Laden's rampage against the West, leading to...well, you all know where this one is going. Since I have my instrument evaluation this week, I decided to pick up a copy of Microsoft Flight Simulator X--after all, instruments are instruments regardless of whether you're in a Cessna, a Black Hawk, or an SR-71 jet. Now, it's actually quite difficult to fly with the keyboard and perform the other functions of MS Flight Simulator at the same time--namely, talking to air traffic control--so I decided I needed to buy myself a joystick. Imagine my surprise when I learned that hardly anyone sold joysticks anymore. I guess everyone stopped buying joysticks shortly after Falcon 4.0 came out. 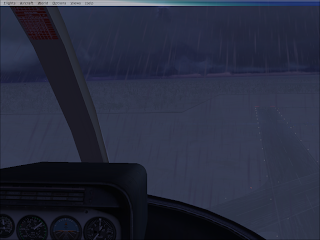 One interesting aspect of MS Flight Simulator is its authentic, real-time weather, updated from Jeppsen every 15 minutes. Behold Watertown International Airport in Sackets Harbor, New York where the current conditions are actually worse than MS Flight Sim's "Heavy Snow" default option. Great VOR and ILS approaches, though. You may remember the crash of a UH-60 Black Hawk helicopter in Germany earlier this month, which killed all three crew members. Although I did not know any of the occupants personally, I thought that this online tribute to one of the pilots, Chief Warrant Officer 3 Gary M. Farwell, was particularly moving. The Army Aviation community is a rather close-knit community, yet we find ourselves spread all over the world. Web 2.0 technologies, however, have helped us keep in touch in ways previously unthinkable, allowing old comrades to swap pictures, video and stories with their friends all over the world. Tragically, the nature of the business is such that Army Aviators, upon hearing of a fatal aircraft crash, will immediately turn on the news or go to sites such as Army Air Crews.com in order to see if one of their friends was involved. After multiple duty stations and deployments, an aviator might have friends in all corners of the world, most of whom are unable to pay their respects in person. In the last few years, virtual memorial sites have become popular, such as the one for CW3 Farwell. Often consisting of a guestbook, pictures and video--sometimes even a Twitter feed or a Facebook page--it's a touching way for friends all over the world to pay their respects when they are unable to do so in person. CW3 Farwell's site even allows one to donate to a Memorial Trust. It's yet another powerful way in which Web 2.0 has changed the way we interact with one another. CW3 Farwell was 39 at the time of the crash, and left behind a wife and three children. WASHINGTON — The Taliban’s top military commander was captured several days ago in Karachi, Pakistan, in a secret joint operation by Pakistani and American intelligence forces, according to American government officials. The commander, Mullah Abdul Ghani Baradar, is an Afghan described by American officials as the most significant Taliban figure to be detained since the American-led war in Afghanistan started more than eight years ago. He ranks second in influence only to Mullah Muhammad Omar, the Taliban’s founder and a close associate of Osama bin Laden before the Sept. 11 attacks. Mullah Baradar has been in Pakistani custody for several days, with American and Pakistani intelligence officials both taking part in interrogations, according to the officials. It was unclear whether he was talking, but the officials said his capture had provided a window into the Taliban and could lead to other senior officials. Most immediately, they hope he will provide the whereabouts of Mullah Omar, the one-eyed cleric who is the group’s spiritual leader. Disclosure of Mullah Baradar’s capture came as American and Afghan forces were in the midst of a major offensive in southern Afghanistan. His capture could cripple the Taliban’s military operations, at least in the short term, said Bruce O. Riedel, a C.I.A. veteran who last spring led the Obama administration’s Afghanistan and Pakistan policy review. Details of the raid remain murky, but officials said that it had been carried out by Pakistan’s military spy agency, the Directorate for Inter-Services Intelligence, or ISI, and that C.I.A. operatives had accompanied the Pakistanis. The New York Times learned of the operation on Thursday, but delayed reporting it at the request of White House officials, who contended that making it public would end a hugely successful intelligence-gathering effort. The officials said that the group’s leaders had been unaware of Mullah Baradar’s capture and that if it became public they might cover their tracks and become more careful about communicating with each other. The opinions expressed on this site are those of the author and do not necessarily reflect those of the US Department of Defense.